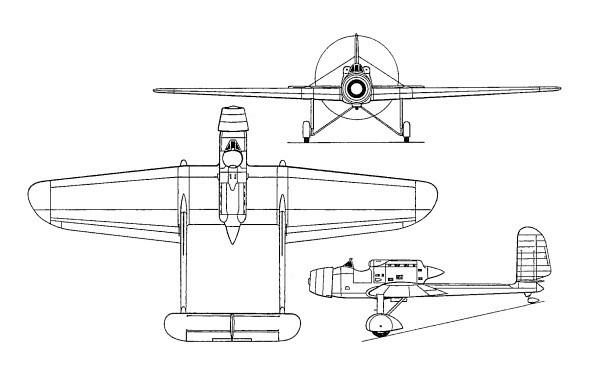 Debuting in April 1933, the H.110 fighter was designed by Jean Biche. It was a contender in the C1 competition promoted initially by the Service Technique de l'Aeronautique in 1930 and upgraded in January 1931 by a supplement to the specification. Tne H.110 was a single-seat fighter in which the pilot and engine occupied a central nacelle, and twin parallel booms attached to the extremities of the wing centre section carried the tail assembly. Of all-metal construction, the H.110 was powered by a 500hp Hispano-Suiza 12Xbrs geared and supercharged liquid-cooled engine driving a three-bladed pusher propeller. A ring-type radiator was mounted in the nose of the nacelle and embodied an adjustable cone to regulate the airflow. Largest and heaviest of the contending fighters, the H.110, which carried an armament of two fixed 7.5mm MAC machine guns, proved slower and less manoeuvrable than most of its competitors. In March 1934, it was returned to the Bourges factory for modifications, re-emerging as the H.115.